Rush Hour (1999), by William Price, was realized in the Music and Art Digital (MAD) Studio at Louisiana State University. It was compiled using Csound, IRCAM's Audiosculpt, SoundHack, ProTools, and SoundDesigner II software. FM synthesis, phase vocoding, and granular synthesis techniques were used in the creation of the composition. Rush Hour is a semi-dramatic, quasi-improvisatory composition that was inspired by the concept of the practicing performer and his or her desire for improvisatory perfection. John Perrine, for whom the work was written for and dedication to, was used as the model for the sampling procedures. All saxophone sounds that are used on the tape portion of the composition were derived from recordings of his performances of improvisatory excerpts, which were extracted and manipulated using various computer programs. Various melodic fragments and jazz recordings (John Coltrane and Miles Davis) were used to connect the performer's aesthetic reality, the imaginary soundscapes that he or she aspires to, and the concept of improvisation. The scenario: An aspiring musician arrives home from a hard day at the (fill-in-the-blank). As the performer settles into his or her practice routine, the sound of traffic becomes more ethereal and is incorporated into the music that he or she is practicing. Fantasy becomes motive to develop within the reality of the performer's existence. Distorted traffic sounds, radio signals, jazz fragments, and the saxophonist's own sounds become a enriched tapestry of memories, impressions and influences. Near the end of piece, the performer is shocked back into his mundane reality only remembering fleeting images of what could or what will be. John Perrine premiered works by Kari Juusela, Aaron Johnson and William Price. He has performed at regional and national North American Saxophone Alliance conferences. Perrine has also performed with the Stetson University Wind Ensemble playing Paul Creston's Concerto. He has won the Stetson University Concerto Competition and the Central Florida Jazz Society's improvisation competition. Perrine has performed with the Louisiana State IJniversity Wind Ensemble playing Michael Colgrass' Urban Requiem and the Louisiana State University Orchestra playing the Philip Glass Concerto for Saxophone Quartet and Orchestra with the Red Stick Saxophone Quartet. John is a founding member of the quartet. The quartet has won prizes in the Fischoff Chamber Music Competition as well as the MTNA national runner-up. The quartet also placed in the finals of the Coleman Chamber Music Competition. 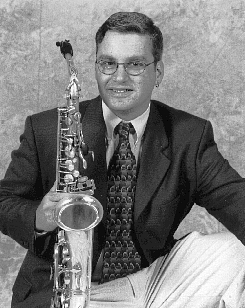 Mr. Perrine is currently lecturer of saxophone and jazz studies at Southeastern Louisiana University. He is also a doctoral candidate at Louisiana State University. Perrine holds a BME from Stetson University and a MM from Northwestern University. His teachers include James Bishop, Fred Hemke, Jonathon Helton and Griffin Campbell. He has studied jazz from Harold Blanchard, Don Owens, Tony Garcia and Michael Koucour.